London, United Kingdom, 16 January 2019 – The world’s ability to foster collective action in the face of urgent major crises has reached crisis levels, with worsening international relations hindering action across a growing array of serious challenges. Meanwhile, a darkening economic outlook, in part caused by geopolitical tensions, looks set to further reduce the potential for international cooperation in 2019. 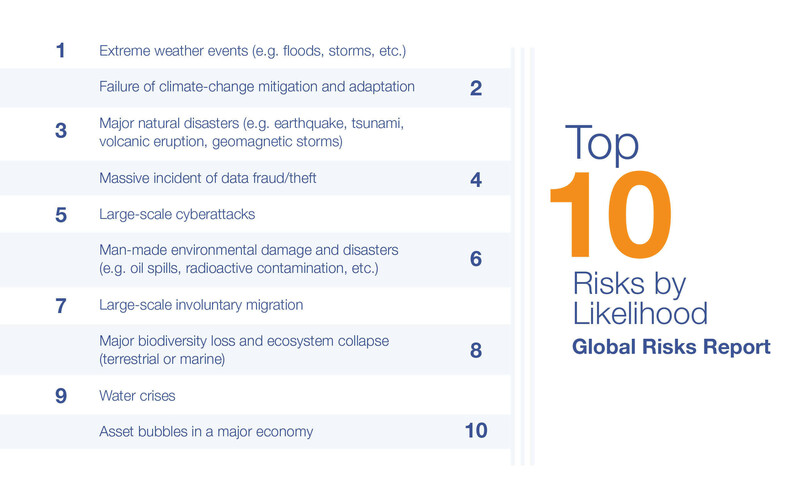 These are the findings of the World Economic Forum’s Global Risks Report 2019, which is published today. The Global Risks Report, which incorporates the results of the annual Global Risks Perception Survey of approximately 1,000 experts and decision-makers, points to a deterioration in economic and geopolitical conditions. Trade disputes worsened rapidly in 2018 and the report warns that growth in 2019 will be held back by continuing geo-economic tensions, with 88% of respondents expecting further erosion of multilateral trading rules and agreements. If economic headwinds pose a threat to international cooperation, efforts will be further disrupted in 2019 by rising geopolitical tensions among major powers, according to the report. Eighty-five percent of respondents to this year’s survey said they expect 2019 to involve increased risks of “political confrontations between major powers”. The report discusses the risks associated with what we describe as a “multiconceptual” world order – one in which geopolitical instabilities reflect not only changing power balances but also the increasing salience of differences on fundamental values. “With global trade and economic growth at risk in 2019, there is a more urgent need than ever to renew the architecture of international cooperation. We simply do not have the gunpowder to deal with the kind of slowdown that current dynamics might lead us towards. What we need now is coordinated, concerted action to sustain growth and to tackle the grave threats facing our world today,” said Børge Brende, President of the World Economic Forum. 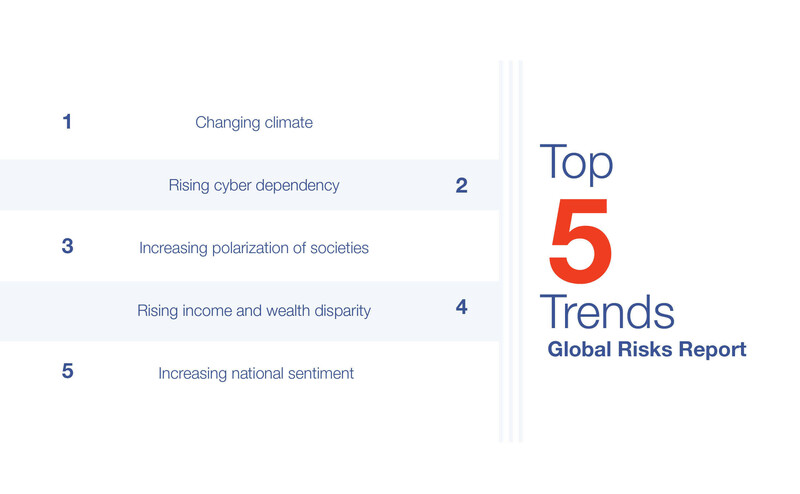 In the survey’s 10-year outlook, cyber risks sustained the jump in prominence they registered in 2018, but environmental risks continue to dominate respondents’ concerns beyond the short term. 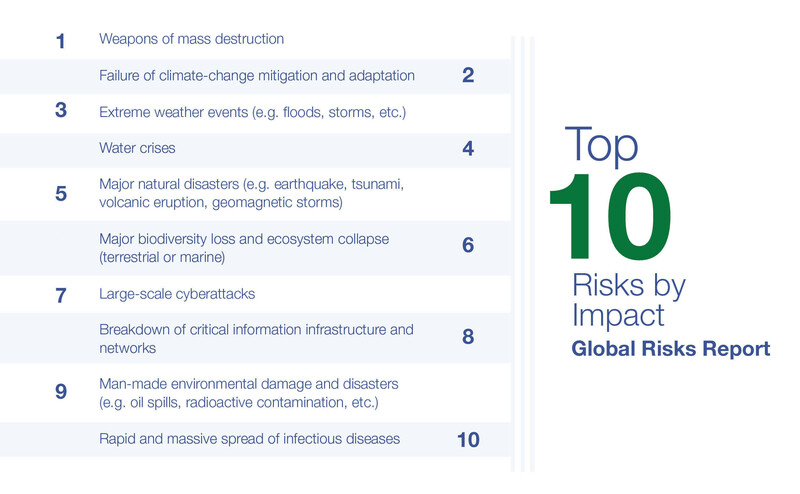 All five of the environmental risks the report tracks are again in the high-impact, high-likelihood category: biodiversity loss; extreme weather events; failure of climate-change mitigation and adaptation; man-made disasters; and natural disasters. Environmental risks also pose problems for urban infrastructure and its development. With sea levels rising, many cities face hugely expensive solutions to problems that range from clean groundwater extraction to superstorm barriers. Shortfalls of investment in critical infrastructure such as transport can lead to system-wide breakdowns as well as exacerbate associated social, environmental and health-related risks. At an individual level, declining psychological and emotional well-being is both a cause and consequence within the wider global risks landscape, impacting, for example, social cohesion and political cooperation. The Global Risks Report 2019 focuses explicitly on this human side of global risks, looking in particular at the role played by complex global transformations that are under way: societal, technological and work-related. A common theme is that psychological stress relates to a feeling of lack of control in the face of uncertainty. This year’s report revives the Future Shocks series, which recognizes that the growing complexity and interconnectedness of global systems can lead to feedback loops, threshold effects and cascading disruptions. These “what if” scenarios are food for thought as world leaders assess potential shocks that might rapidly and radically disrupt the world. This year’s sudden and dramatic breakdowns include vignettes on the use of weather manipulation to stoke geopolitical tensions, quantum and affective computing, and space debris. 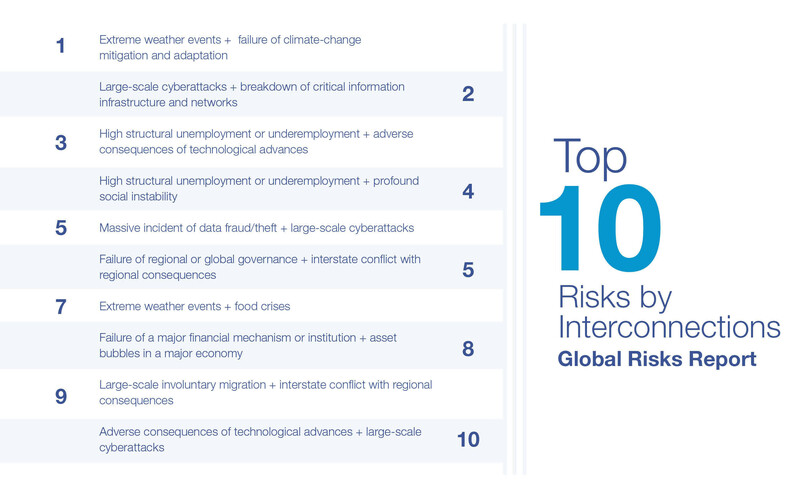 The Global Risks Report 2019 has been developed with the invaluable support throughout the past year of the World Economic Forum’s Global Risks Advisory Board. It also benefits from ongoing collaboration with its Strategic Partners Marsh & McLennan Companies and Zurich Insurance Group, and its academic advisers at the Oxford Martin School (University of Oxford), the National University of Singapore and the Wharton Risk Management and Decision Processes Center (University of Pennsylvania).